I instantly fell in love with their Vitamin C+ which I will detail in a separate post later.. But vitamin C+ = brighter skin! 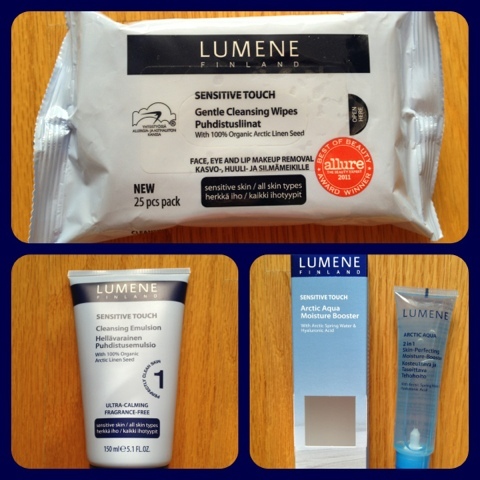 For traveling the Lumene Sensitive Touch- perfect for those who have sensitive skin like myself- carries gentle cleansing wipes to remove makeup, dirt, oil-anything! It leaves your skin completely hydrated which is nice and doesn't leave a residue. You'll feel refreshed and who doesn't like that? Also I tried their Cleansing Emulsion, for those who want to use a gentle cleanser. Also moisturizing and left my skin feeling amazing! Their Arctic Aqua Moisture Booster is the moisturizer you want for the summer- it is water based and doesn't feel heavy at all. It is completely hydrating and I definitely felt a difference after my first use.